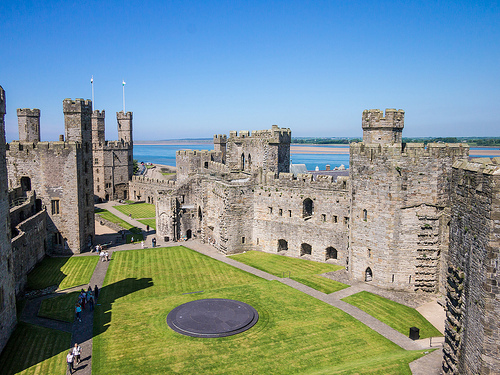 Billed as probably the most picturesque town in the whole of North Wales, Caernarfon has become a magnet for tourists. People come to the town not only for the imposing and impressive castle but also because the town has been used as a backdrop on major television series in recent years which has made people want to walk in the footsteps of the stars. You can’t help but be impressed by the castle and its unique polygonal towers and artistic design to the masonry, but there is much more to this pretty town than just the castle. This is a part of Wales with a long and impressive history, people have been living in this part of Wales since the time of the ancient Greeks, and the Ancient Romans even built a fort here during their conquest of the British Isles. All around the town you will find reminders of the towns medieval past, not only in the form of castles but in the very streets of the town. The history of the town can also be traced through to the modern day with artefacts from the post industrial era. Though an ancient and historic town this is a place that is very much filled with modern life, from the busy bars and restaurants to the modern stores and attractions. Try as you might though, history is never far away as you can find traditional Welsh pubs that date as far back as the 16th century alongside modern bars and clubs. With a massive 80% of the population here speaking Welsh it has the highest proportion of Welsh speakers in the whole of the country. It is a great place to find traditional welsh literature and brush up on your language skills too. But of course you could not plan a trip to the town without including a trip to the incredible castle that dominates the landscape. The castle itself can be dated as far back as 1283 when it was constructed under the orders of King Edward I, it was hoped that the massive fortress would subdue the local population into succumbing to English rule. Today the fortress is regarded as one of the best examples of architecture from the period in existence and has been placed on the UNESCO list of World Heritage Sites. You are in the perfect area to explore Snowdonia National Park, and one of the best ways to explore the park is by taking a ride on the Welsh Highland Railway. Unlike modern railways here you will be travelling in a carriage being pulled by an authentic steam locomotive, which will give you a unique view and perspective of this beautiful part of the world, and travelling under steam power you will have plenty of time to enjoy it. The park is made up of 823 square miles of incredible landscapes. The park is a fabulous place to indulge in outdoor activities from trekking and mountain biking to bird watching and walking.